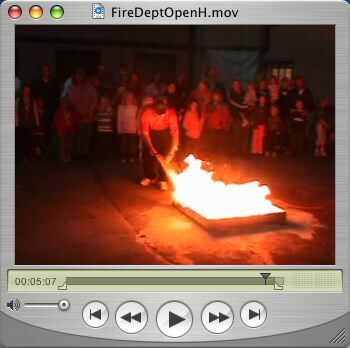 The Cold Spring Fire Department held its annual Open House and Fire Prevention Education Day on Tuesday, October 11, 2005. Much of the day local firefighters spent educating elementary students on fire safety and a tour of the fire trucks. Students were also encouraged to color a drawing of a fire truck and bring it to the fire hall that evening for prizes and a special drawing. In the evening, the entire department boarded all of their trucks and vehicles for a tour of the town looking for kids who practiced fire safety at home that night. Fire prevention is about the three "P's". Plan, Prevent and Practice. October 9-16 is Fire Prevention Week. CLICK ON PHOTO OR QUICKTIME TO SEE MOVIE... be patient... CAN TAKE 4 to 5 MINUTES TO DOWNLOAD... this is a 20 megabyte streaming file.